> New land laws in Africa: Are they equitable and efficient? The aim of forest certification, as established by the Forest Stewardship Council (FSC) in 1993, was to raise forest management standards in the large tropical forest areas around the world in order to make them more sustainable. Sustainable management implies forest planning based on inventories; monitoring and evaluation; improved sylvicultural techniques and biodiversity conservation. Tropical forests present an enormous management challenge due to a complex set of issues. In terms of the forests themselves, they often have more than 400 different tree species and cover a large surface area. Governments in these areas often have limited resources and capacity; the rights of the local communities tend to be largely ignored; tenure rights are often poorly defined and in some cases corruption is institutionalised. Of the 100 million hectares of forest certified worldwide, only 3% are in tropical settings, and of this certified tropical area only a very small percentage is in natural forest settings. initiatives, have produced promising results in Russia and Central and South America. resulting in the mapping of 5.5 million ha of HSVF in the Komi Republic. Since the exploitation of HCVF in theory requires FSC approval, the various project partners were encouraged to set up a regional FSC Working Group. Although this process has had a positive impact on the planning of sustainable forest management, it has yet to become fully integrated in current forest practices. 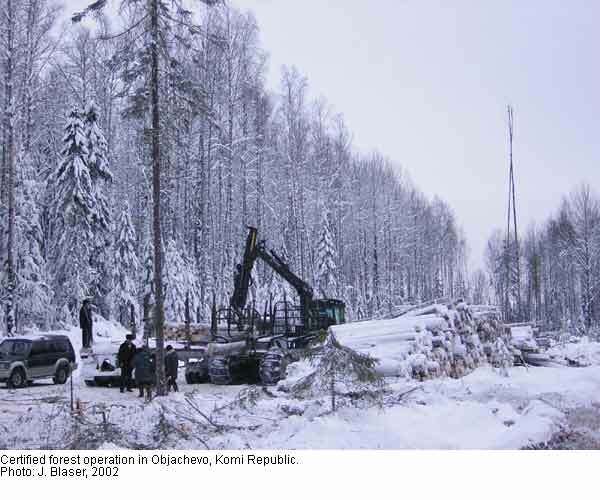 The process in Russia suffers from a weak institutional basis: instability of local forestry authorities, short-term concessions and little knowledge of the value added gained through certification, to name but a few. Nevertheless, IKEA works closely with the WWF to develop the ”staircase” model in Russia, an innovative certification approach. It is based on an audit to pinpoint non-compliance of current forestry practices with the sustainable forest management standard. The next step is to develop a plan of action to remedy the situation, and then regularly check its impact and any positive developments to which it may give rise. IKEA uses this model to increase the quantity of certified wood and to ensure that its home furnishing products come from sustainable forests. Source: Certification in complex socio-political settings: looking forward to the next decade. Ed. Michael Richards. Forest Trends, 2004. 33 p.
década. Ed. Augusta Molnar. Forest Trends, 2003. 91 p.
> Etude de faisabilité sur la certification forestière panafricaine. Ed. Indufor Oy. INDUFOR, 2002. 112 p.
Does globalisation foster or endanger adapted and diversified agriculture? difficult as a result of the different positions taken on liberalisation of agriculture. Two recent publications discuss consequences and pportunities related to agricultural liberalisation from different perspectives. Colin Hines believes that diversified local food systems, and hence food security, are endangered. Global enterprises are increasingly influencing agricultural production. Increases in production are being achieved at the cost of employment conditions and environmental and social conditions. Hines advocates ”localisation” of economic life, with a focus on local self-determination and independence. The authors of the discussion paper entitled ”Agriculture and Rural Development”, on the other hand, believe that liberalisation offers an opportunity for smallholders. By diversifying their product range and moving away from industrial monocultures, they will be able to profit from liberalised world trade. But diversified production systems, adapted to natural conditions, must be able to respond with flexibility to the needs and demands of the market. Access to current market information, new technologies, and educating farmers are the most important conditions for successful diversification. International donors must offer support if poor population groups are also to benefit from these opportunities. democratic localisation. Colin Hines. IIED 2003. 79 p.
> Agricultural Diversification for the Poor: Guidelines for Practitioners. Paper 1. The World Bank. 2004. 48p. One important pillar of the World Bank’s new rural strategy is the promotion of agricultural growth to reduce poverty, while also giving consideration to sustainable management of natural resources. A new online sourcebook aims to help implement this goal. This reference work gives project directors and other interested parties an overview of positive (along with some negative) best practices and innovations relating to agricultural investments to alleviate poverty. details about planning and implementation of investments. While the first edition of this sourcebook is based primarily on best practices garnered by the World Bank, incorporation of best practices from other development organisations and countries is planned for later editions. Source: Agriculture Investment Sourcebook. World Bank. 2004. This country-led initiative organized by Switzerland (SAEFL, SDC, Intercooperation) and Indonesia (Government and CIFOR) in support of the United Nations Forum on Forests (UNFF) sought ways to improve the quality of ”on the ground” forest-related activities. Questions regarding the balance between centralization and decentralization, with a special focus on problems that occur during transitional phases of the decentralization processes, were discussed. As Jagmohan Maini, a UN professional, said, ”the many thoughtful presentations and the outputs from the Working Groups at the Workshop collectively constitute a very significant contribution to the UNFF process, particularly in structuring the future deliberations and debate on the topic in a more systematic manner, in terms of concepts and the vocabulary”. A side event was organized at the 4th meeting of the UNFF in Geneva on 4th May, with more than 60 participants, to inform the intergovernmental community about the outcome of the Interlaken workshop. through resource use that has been adapted to natural conditions over hundreds of years, particularly in arid regions. Their migrations across different habitats and sometimes across national boundaries create linkages between different ecological zones, thereby increasing the dispersion of seeds and insects. These traditions have created biological corridors that are very important today for the preservation of entire landscapes. alliance is also and above all committed to ensuring that protected areas are not used to exclude mobile indigenous peoples from their traditional grazing and migratory areas. Source: World Alliance of Mobile Indigenous Peoples. 2003. New land laws in Africa: Are they equitable and efficient? In the last two decades traditional rules on land ownership and land use have been incorporated into new land laws in sub-Saharan African countries. Greater attention has been given to the rights of vulnerable population groups such as women, pastoralists and migrants, and responsibility for the granting of land rights and registration has been partly handed over to local institutions. But is this enough for equitable and efficient regulation of land ownership as an important condition for sustainable land management? An IIED study made a comprehensive analysis of the current status of land ownership and administration, drawing conclusions from experience in areas such as land security, redistribution of land, decentralised management, and improved conditions among vulnerable groups. A lack of institutions, an insufficiently informed population, and the need for increased linkage between land reforms and development were three of the shortcomings identified. land issues. The diversity of social, legal and historical conditions is so vast in African countries that such an aim would be difficult to achieve in the scope of a summary study such as this one. both the number of stakeholders involved in community-based forest management and the surface area of new plantations. > Enhancing stakeholder participation in national forest programmes. practice, Rome, 24–25 November 2003. 3 p.
The marked increase in demand for meat and dairy products in developing countries could prove an opportunity for millions of poor livestock keepers. However, livestock services provided by development programmes so far are not sufficiently oriented towards small-scale livestock farming and poverty reduction. A new study based on literature and case studies has investigated into the question of what measures are needed to change this. financial services for the poorest. Very little attention is given to the consideration of environmental concerns. coordinating and sharing experiences. IFAD, DANIDA, The World Bank. 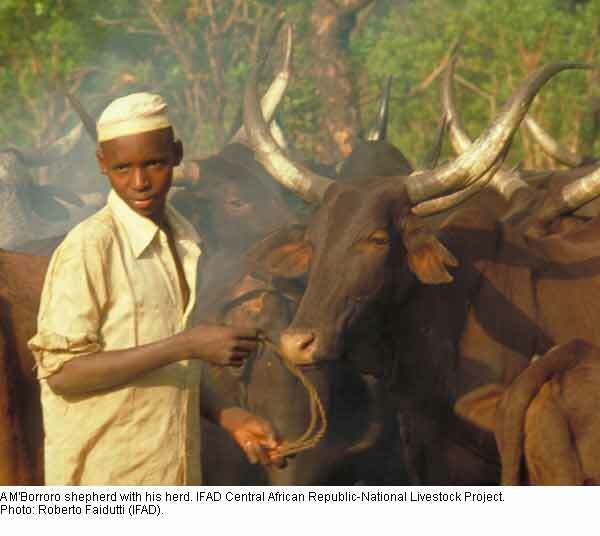 For further reading: The Role of Livestock in Economic Development and Poverty Reduction. Martin Upton. Pro-Poor Livestock Policy Initiative Working Paper No. 10, FAO, 11. February 2004. 66p. Three ICT projects in India strive to achieve one common goal: to provide the rural population with useful information. Village centres equipped with computers and internet access – so-called kiosks – function as information hubs and can be consulted by farmers seeking information on the weather, market prices, and agricultural know-how; project employees provide advice. One of the projects is run by the government, the second by a sugar cooperative with government support, and the third is run by an agricultural supply company. less for searching for information. Due to their different nature, the three projects were hardly comparable. exhausted, these projects are more than just conventional extension services with a particularly generous computer budget. Numerous initiatives by the state, NGOs and the private sector to introduce ICT in rural regions will certainly develop quickly. They will contribute to narrowing the digital gap between rural and urban areas. Development: A Comparative Analysis of Three Projects from India. Shaik. N. Meera, Anita Jhamtani, D. U. M. Rao. In: AgREN Network Paper No.135, odi, January 2004. 20p. One of the Millennium Development Goals is to halve the percentage of the world’s population with no access to clean drinking water, sanitary installations and waste water treatment plants by 2015. This goal can only be achieved if government institutions, multilateral organisations, the private sector, and civil society join forces. Better integrating the private sector is one possibility to improve efficiency in the water sector. However, there is often a lack of guidelines and instruments to help plan and implement effective, efficient and equitable PSP projects. Swiss Re have launched an initiative to develop policy principles describing stakeholders’ basic values, key factors, functions, and responsibilities, as well as implementation guidelines for specialists featuring information on specific tools and examples of successful PSP projects. Among others, the initiative mentions the following key factors as necessary preconditions for successful private sector participation: poverty responsiveness, resource conservation, transparency, socially and economically balanced financing, and proactive risk management. will provide support for operational implementation of PSP projects. Source: Policy Principles and Implementation Guidelines for Private Sector Participation in Sustainable Water Supply and Sanitation Services. Swiss Agency for Development and Cooperation SDC, SwissRe, State Secretariat for Economic Affairs seco. April 2004.
variety, he managed to breed a promising new kind of rice. The most important advantages of NERICA are: higher yields, shorter vegetation period, higher protein content and resistance against pests and draught. Such a rice variety has a great potential in West and Central Africa. The food situation in this area is critical. In addition, the demand for rice increases by 6% every year due to urbanisation and changing consumption habits. To meet these needs, rice is imported at high costs. The 20 million local smallscale producers – a large portion of them being women – do not have the money necessary to increase the yield of conventional varieties by irrigation, fertilisation or pesticides. NERICA can help improve this situation. In 1996 the first farmers evaluated the new varieties. During recent years the cultivation area of NERICA has grown considerably in the highlands of West and Central Africa. The NERICA project intends to introduce the rice variety also in the lowlands, where the climate is different, and in East Africa. The great breakthrough has yet to come: The adoption of new products by farmers takes time. World Food Prize. Press Release. The World Food Prize Foundation. 3 p.
> NERICA on the move. A symbol of hope for rice farmers in Africa. 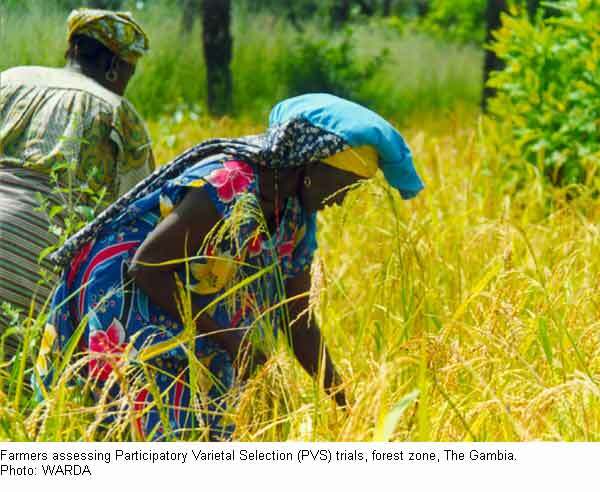 West Africa Rice Development Association (WARDA) – 2003. 5 p.
> New Rice for Africa: NERICA – Rice for Life. West Africa Rice Development Association (WARDA), 2001. 8 p.